Pleasanton is reported being number 4 by “USA Today” in “America’s 50 best cities to live in” in 2014, number 63 in Money‘s list of “The Best Places to Live” in 2010, and was also named one of “Americans’ Top Hometown Spots” in the United States in 2009 by Forbes. Pleasanton is located at 37°40′21″N 121°52′57″W (37.672530, -121.882517) and is adjacent to Hayward, Livermore, and Dublin. According to the United States Census Bureau, the city has a total area of 24.3 square miles (63 km2), of which, 24.1 square miles (62 km2) of it is land and 0.2 square miles (0.52 km2) of it (0.63%) is water. On the east side of town on Stanley Blvd. near the Livermore border is Shadow Cliffs Regional Park, a lake that holds swimming, fishing, and boating. On the west side is the Pleasanton Ridge with the two parks Pleasanton Ridge and Augustin Bernal Park. Much of Pleasanton is drained by the Arroyo del Valle and Arroyo Mocho watercourses. Pleasanton lies along the route of the historic First Transcontinental Railroad. The highest recorded temperature was 115 °F (46.1 °C) in 1950. The lowest recorded temperature was 17 °F (-8.3 °C) in 1990. Because of the preservation of Pleasanton’s historic downtown area, many examples of architectural styles dating back to the mid-19th century exist. Buildings in Gothic Revival, Pioneer, Italianate, Commercial Italianate, Colonial Revival, and Queen Anne styles can be found within walking distance of each other. One of the icons of downtown Pleasanton is the Kolln Hardware building, located at 600 Main Street. It is designed in the Commercial Italianate style, but the prominent five-sided corner tower and a few other features are indicative of the Colonial Revival style. The structure mixes in a little bit of Queen Anne design in the tower and gable. This building was built in 1890 and has always housed a hardware store, first by the Lewis Brothers, then Cruikshank and Kolln. The hardware store has been known as Kolln Hardware since 1933. In 2004, the Kolln Hardware business shut its doors. Bud Cornett, a Pleasanton developer, purchased the landmark and has invested in its renovation and earthquake retrofit. After more than 100 years of serving the community as a hardware store, the space has now been taken over by Comerica Bank. La Hacienda del Pozo de Verona (The House of the Wellhead of Verona) was another Pleasanton landmark that was destroyed by a fire in 1969. Construction was originally started by architect A.C. Schweinfurth for William Randolph Hearst in the 1890s. Phoebe Apperson Hearst had the hacienda remodeled and expanded by architect Julia Morgan for use as her primary residence after her husband died. The estate was built upon a 453-acre (1.83 km2) rancheria obtained in 1886 by George Hearst, who intended to use the location for a race horse farm. The name was inspired by the circular, carved marble wellhead purchased by Phoebe and William in Verona, Italy and installed in the middle of the courtyard. The hacienda was the only female-owned estate to be mentioned in Porter Garnett’s Stately Homes of California. The architecture of the hacienda has been called California Mission style by various sources. The original architect used the term “provincial Spanish Renaissance”, while Garnett wrote it would be more accurately called “Hispano-Moresque”. Moorish influence was found throughout the estate, such as in the guardhouses which stood on either side of the courtyard entrance. The hacienda was topped by imported red Spanish tiles and had undecorated walls of white stucco. After Phoebe’s death in 1919, William had the wellhead and other furniture and objects moved to Hearst Castle at San Simeon and sold the estate. Pleasanton continues to maintain a small town flavor with regular events for the community. Every Saturday morning a farmers’ market sets up on Angela, off Main Street. In 2009, Pleasanton appeared on Newsmax magazine’s list of the “Top 25 Most Uniquely American Cities and Towns,” a piece written by current CBS News travel editor Peter Greenberg. The article cited the popular farmers’ market among the reasons for the city landing on the list. There are several parades during the year, commemorating Christmas, Memorial Day, and Veterans Day, as well as kicking off the beginning of the Alameda County Fair and soccer season. The Pleasanton Downtown Association organizes the popular First Wednesday celebrations from May through September. On every first Wednesday of those summery months, Main Street is blocked to traffic and adopts a street fair atmosphere. Each First Wednesday celebration is given a different theme and planned with related activities. Typically the first theme is Cinco de Mayo since May is the first month for these street parties. At this local event, businesses and organizations from downtown and around the Tri-Valley set up booths in the center of the street. A local band performs in the Round Table Pizza parking lot, which is closed off for dancing. The parking lot is also set up as a beergarden, with beer and wine available for consumption. Another Pleasanton Downtown Association tradition is the Friday Concerts in the Park series. Every Friday from June until September the PDA schedules different local bands to perform in the evenings at the Lions’ Wayside Park off of First Street. The events are free of charge and draw a crowd. Locals will start laying out blankets in the park on Friday mornings as a way to reserve a spot. The Alameda County Fair runs annually at the Fairgrounds in Pleasanton, which includes many rides and as well as horse races. Many car shows are held at the Fairgrounds during the fair’s off-season, and California’s largest Scottish Highland Games are held there annually. The Firehouse Arts Center, opened in 2010, is a center of culture and art for Pleasanton. It features a 227-seat theater, the Harrington art gallery, and classrooms for art and drama. It is also home to the critically acclaimed teen improv comedy troupe, Creatures of Impulse. Pleasanton experienced a major economic boom starting in the early 1980s, largely associated with the development of a number of business parks, the largest of which is the Hacienda Business Park. These host a number of campus-like clusters of low-rise and medium-rise office buildings. Pleasanton has been successful in attracting a number of corporate headquarters, such as those of Safeway, Blackhawk Network, Thoratec, Workday, Simpson Manufacturing, The Cooper Companies, Shaklee, Patelco Credit Union, and Ross Stores. Despite an increase in office space vacancy rates in 2000–2004, economic development has remained strong through the middle of the decade. Pleasanton was also the headquarters of the former PeopleSoft, Inc. (which was acquired by Oracle Corporation), Documentum (which was acquired by EMC Corporation), E-Loan (which was acquired by Popular), Spreckels Sugar Company (which was acquired by Imperial Holly) and the home loan operation of Providian (which was acquired by Washington Mutual, itself later acquired by JPMorgan Chase). 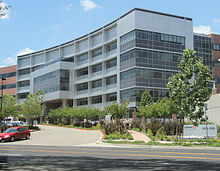 Oracle maintains the former Peoplesoft campus as a major division and is the fourth-largest employer in Pleasanton, behind Workday, Safeway and Kaiser Permanente. In addition, Pleasanton is the site of a large AT&T campus. Other companies with major operations in Pleasanton include Hitachi High Technologies America, Inc., Cisco Systems, Sage Software (Accpac, etc. ), CooperVision, Clorox, Fireside Bank (closed in 2012), Roche, BMC Software, Applied Biosystems, EMC Corporation, Portrait Displays, Inc. and Symantec. In the retailing field, Pleasanton has one major regional mall (Stoneridge Shopping Center) and a number of other shopping centers. Most national and regional retailers have a Pleasanton location; besides the anchor tenantsNordstrom, Macy’s, Sears, and JC Penney at Stoneridge, notable large stores elsewhere in the city include Home Depot, Wal-Mart, and Kohl’s. In addition to the business parks and retail centers, Pleasanton is known for its lively downtown, which is home to a number of fine-dining, casual, and ethnic restaurants, specialty retailers, and service businesses. A redesign of Main Street in the 1990s emphasized pedestrian traffic and outdoor dining. According to the latest U.S. Census information, Pleasanton is the wealthiest midsize city in the nation. In 2005, the median household income in Pleasanton was $101,022, the highest income for any city with a population between 65,000 and 249,999 people. Similarly, for 2007, the median household income rose to $113,345, also the highest in the category. According to the Bay East Association of Realtors, the median price of a detached single family home is $665,000 as of April 2009.